This entry was posted in Travel and tagged 50 Year Project, Life, Nature, New York, New York City, Photography, Sunsets, Travel, Travel Blog, Travel Journal, Travel Photo. Bookmark the permalink. That really is beautiful! Think you’ve got my favourite picture right there. That and your giraffes. Beautiful! I remember flying into the most incredible sunrise one morning on my way to Seattle years ago, and no one on the plane was awake for me to point it out to!! But it lives on forever in my mind. I love those memories. I can almost picture. Funny that you mentioned Seattle, I was mentioning the other day that I’ve never been and I would love to visit. Thanks Zelmare. I bet you have beautiful sunsets in your part of the world. Nice shot! The city skyline adds an interesting touch. 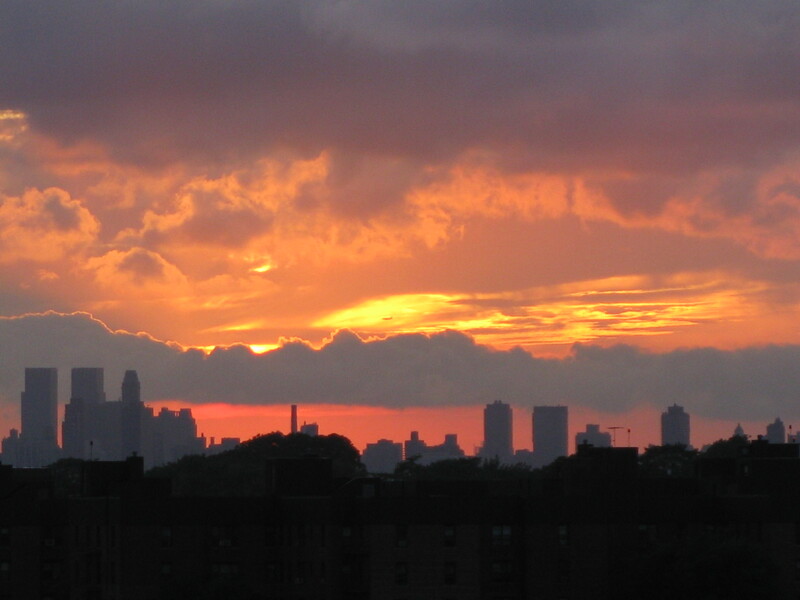 NY has one of the better skylines I’ve seen. Wow, very vibrant and fiery! It looks so fierce, but the golden colors are stunning. Great capture! This is soooo beautiful. I love the different layers of clouds and colours. Great job! Nature put on a show that night! Thanks for replying, I’ve done more music posts if you are interested. Gorgeous shot! The colors are amazing in this picture – I can imagine just how gorgeous it was in person. I know you would have loved it! I’ve been enjoying your photos. You really have an eye! I hope that isn’t all pollution. It’s funny how different people see things. Maybe I’m too skeptical! Thanks. I was there right at the perfect time. NYC is my favorite place. Love this photo!! We love it too and go at least once a year for the US Open.